Brian P. Boland, an associate of the firm, will be the featured speaker at the Risk Management Association (Long Island Chapter) Young Professional’s Educational Networking Seminar “Structuring Collateral and Documentation” on Thursday, October 4, 2018 from 8:00 a.m. – 10:00 a.m. at our Garden City office. The event will include a half hour networking reception with coffee and light breakfast followed by a presentation which will cover a review of loan security and how to ensure enforceable liens. There is no fee to attend. 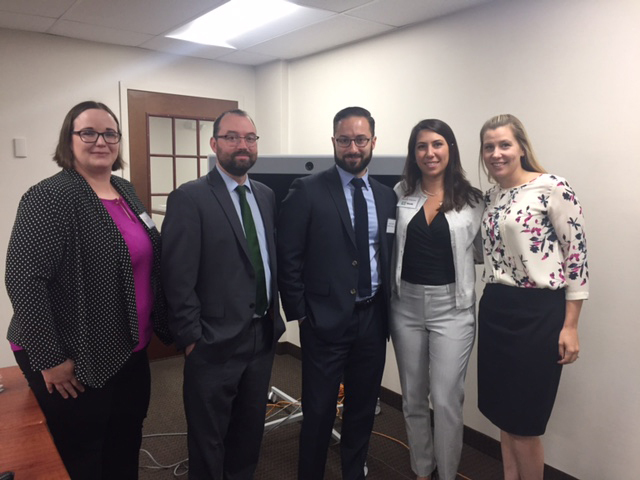 Pictured left to right: Christine Price, Moritt Hock & Hamroff; Brian Boland, Moritt Hock & Hamroff; Andrew Stoecker, Brown & Altman LLP; Danielle McKenna, TD Bank; and Heather Gauweiler, Certilman Balin.